Mukha Abhyangam or Ayurvedic Face Lift Massage was created with a view to addressing current day concerns of people, particularly women, to look youthful and healthy without invasive interventions such as Botox and plastic surgery. Ayurvedic Face Lift Massage is a holistic anti-ageing tool and a real workout for the face. Just as regular visits to the gym can keep you looking fit and toned, so also can regular face massages lift and tone muscles, soften your features and keep you looking radiant with the renewed blood and oxygen supply to your face. Kneading facial muscles brings nutrients to the treated area, helping the collagen fibres retain their elasticity. Stimulating marma points releases energy blockages. While nothing can permanently halt the ageing process, we can lessen the appearance of damage to our skins through massage, a more positive lifestyle and outlook, staying out of the sun and reducing our exposure to harmful chemicals. 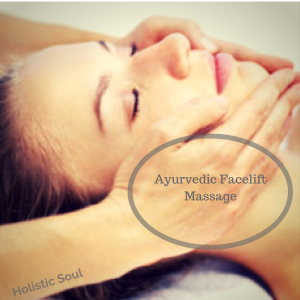 Ayurvedic Face Lift Massage is tailored to an individual, using oils and techniques that are suitable to the person’s constitution (prakruti). It incorporates marma massage (the stimulation of vital points) to help with the unrestricted flow of energy. Its principles are based on ancient massage techniques that have been tried and tested over centuries. This amazing face massage treatment can also be combined with any other treatment on request.